When it comes to Fantasyland, aside from Sleeping Beauty's Castle, there isn't really a lot of overt Christmas theming--no wreaths, no twinkle lights, no holiday ornaments. And then you get to It's a Small World... tucked away in the back of the land, next to the entrance of Mickey's Toon Town, and if it's nighttime, you cannot help but notice the holiday decorations. The attraction facade is ablaze with a visual blitzkrieg of colors and lumens. It's like a Christmas house on steroids. Thousands upon thousands of twinkling lights across the entire color spectrum trace the outlines of Mary Blair's iconic facade. It signifies that the "happiest cruise that ever set sail" is now the merriest. Loud and clear, you know: Christmas time is here. 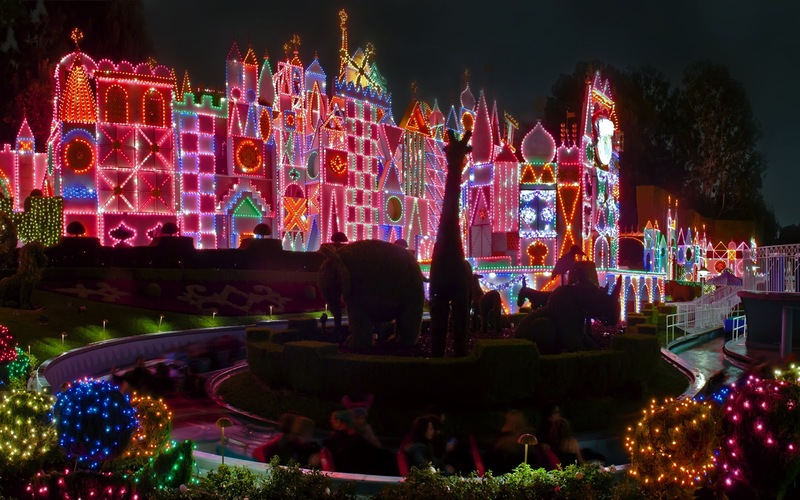 It's a Small World Holiday Edition at night, full of brilliant color.